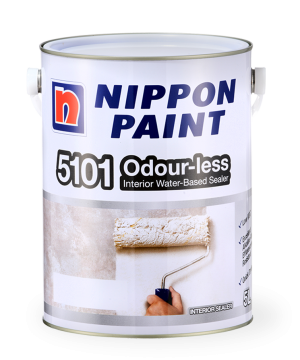 Nippon Paint 5101 Odour-less Water-Based Wall Sealer formulated to prevent deterioration of emulsion paints by alkalinity of surfaces. It is suitable for masonry surfaces and has low VOCs (Volatile Organic Compound) and almost no paint odour during application and drying.This wall sealer is recommended for use in interior plastered walls, ceilings, plaster, brickwork and wall boards. Based on specially formulated acrylic it is designed to provide maximum protection against alkali and moisture, enhancing the performance of top coat.A water-based wall sealer stops liquid water from entering the surface, but allows water vapour out. It is a breathable product that can be applied to brick, concrete block, stucco or any masonry material.